IGNITION: Future Of Digital is a two-day conference in New York City that explores the future of the digital media business. We are living in a time of massive media disruption — and opportunity. The business models and companies that have ruled the media world for the past half-century are under attack, and new companies have come out of nowhere to capture the time and attention of global media consumers. Simultaneously, the definition of "media" is expanding to include social, local, mobile, games, real-time communication and sharing, and data. The line between information, entertainment, advice, and business is blurring. IGNITION will bring together key stakeholders and executives to discuss what's happening now, what's coming next, and how it will affect your business. The conference is produced by Business Insider, one of the fastest-growing digital-media companies in the world, and hosted by Henry Blodget, Business Insider's founder and CEO. If you must cancel for any reason you must notify us in writing by November 9, 2012, for a refund less a $100 processing fee. Cancellations received after November 9, 2012, are non-refundable. 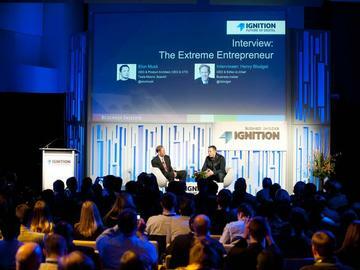 You may transfer your registration to another person by November 23, 2012, by providing authorization to us at ignition@businessinsider.com. Confirmed and paid attendees who do not attend or who cancel after the deadline are liable for the entire fee.